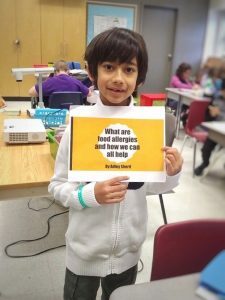 Adley Sherif is a grade 3 student in Toronto who is an active voice for people with food allergies. For his classroom’s “Passion Project” where students choose a topic they are passionate about to present to the class, Adley decided to focus on food allergies. Although he does not have food allergies himself, he wanted his classmates at Beaches Alternative School to have a better understanding of what it’s like to manage food allergies on a daily basis. 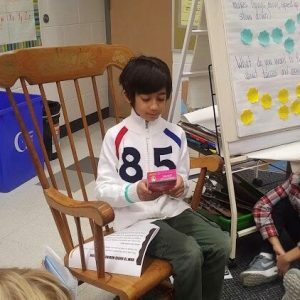 We interviewed Adley to learn more about his food allergy presentation and what his classmates learned. During his presentation, Adley talked about epinephrine, priority allergens, food labels, and how everyone can be more allergy-aware. He also brought in a boxed food product to help his classmates identify the ingredient label and where the priority allergens are listed. “My favourite part was having them guess the priority allergens because I liked how they really tried,” Adley shares. It is very important to triple check food labels, and Adley shows you are never too young to know the priority allergens and where they are found on food labels. His final tip for his classmates? To wash your hands before and after eating. You’re making a big difference Adley! Thanks for being a food allergy hero by helping to create awareness and educate others! Does your child want to be in our next Kids Spotlight? If so, email us their food allergy story and how they are spreading food allergy awareness to info@foodallergycanada.ca. © 2019 Food Allergy Canada.